Outside the brick row houses on Tyler Street in Boston’s Chinatown, a crowd of forty gathered to support YenChi Chen an hour before his court appearance on Valentine’s Day morning. Chen owns A Salon, where he has been cutting hair in Chinatown for seven years. His landlord has been renting out the old row houses’ upstairs units through AirBnB. The rise of AirBnB rentals has led to the eviction of many in the Chinatown community, including Chen. 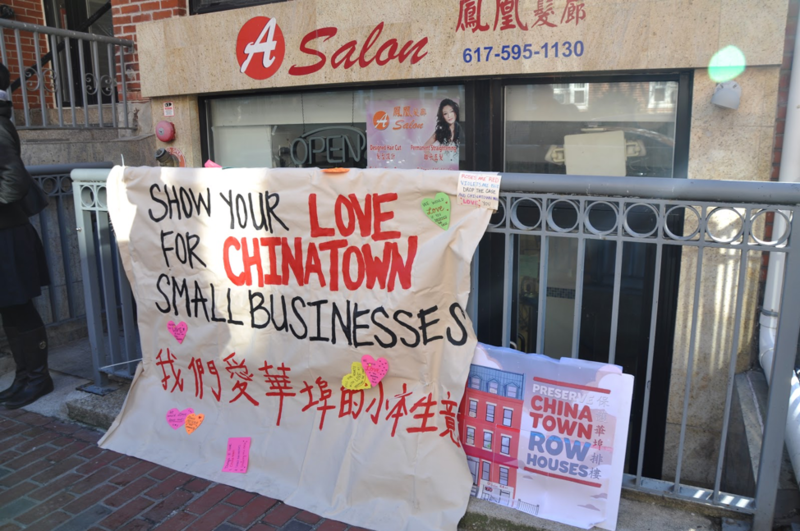 As AirBnB and mass private luxury development in Boston rise, Chen is one of many residents and small business owners in Chinatown who have faced eviction. Likewise, urban renewal in the ‘50s and ‘60s, and institutional expansion in the ‘80s and ‘90s displaced entire blocks. Recent developments on Chen’s street are not an anomaly—they stem from a history of racial exclusion and removal in Chinatown as old as its brick walls. On Tyler Street, Oak Street, and Johnny Court, the 100 remaining brick Federal-style row houses are structural remnants of the resistance against racism and displacement. 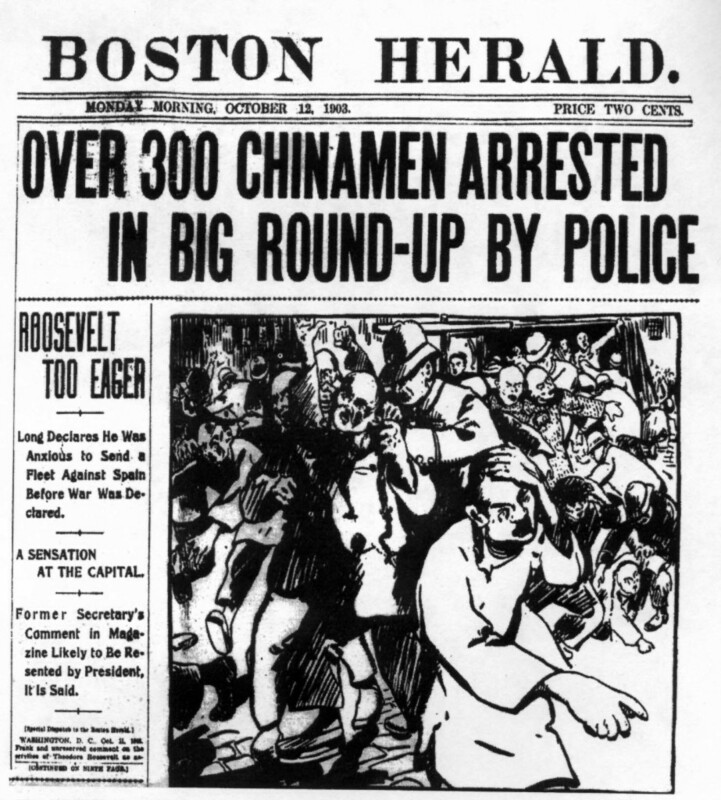 They are a testament to the struggles of working-class Irish, German, Jewish, Italian, Syrian, Lebanese, and Chinese immigrants since the 1800s, when exclusionary immigration law, local anti-Chinese business ordinances, and violent forced removals began their spread across the country. These histories continue to shape the community’s fight for affordable housing today. Low-income Asian immigrant communities have been rapidly priced out of a community that once supported their livelihoods and culture. According to a 2013 Asian American Legal Defense and Education Fund report, the Asian poverty rate in Chinatown was 44 percent in 2009, the highest of any racial group in Boston. While non-Hispanic White median household incomes in Chinatown increased from $40,554 to $84,255 between 2000 and 2009, the Asian household median income actually dropped from $16,820 in 2000 to $13,057 in 2009. Between 1990 and 2010, the non-Hispanic White population of the neighborhood has more than quadrupled, while the Asian population has decreased from 70 percent to 46 percent of residents. While these numbers are emblematic of the increasing gentrification in the area, they only tell part of the story. Mei Qun Huang, a former row house resident on Johnny Court, described the disruption that short-term rentals brought to her life. “My family felt like there was no sense of security,” Huang said. “Every few days there were different people.” Eventually, Huang was pushed out of her home of 20 years by a rent increase. Since 2015, the non-profit Chinatown Community Land Trust (CCLT) has tried unsuccessfully to buy and secure row houses as low-income housing units that will preserve the community’s cultural legacy. According to CCLT Executive Director Lydia Lowe, capital put forth by real estate developers and speculators has outcompeted the land trust’s offers. To bolster acquisition efforts, Lowe has co-led the Chinatown Stabilization Volunteer Committee, a volunteer group raising awareness of the row houses’ cultural and political history. The front of YenChi Chen’s salon on Tyler Street, with a graphic by volunteer artists Shaina Lu and Vivian Ho, lower right. Image by Issay Matsumoto. While efforts by community organizations to acquire privately-owned row house properties have faced enormous odds, Angie Liou has worked with the City of Boston and Chinatown residents to develop new low-income housing units at Parcel 12, a publicly-owned lot next to Tufts Medical Center’s Tremont Street garage. Liou is the Executive Director of the Asian Community Development Corporation (ACDC), a non-profit that creates and preserves affordable housing for underserved and immigrant Asian American communities in the greater Boston area. For over a decade, developers had proposed uses for Parcel 12 without any development. The ACDC responded by spearheading a community-wide “visioning campaign” to put momentum behind a future Parcel 12 development project and understand what Chinatown residents would want from it. The ACDC hosted a series of interactive community meetings at night and on weekends to accommodate residents’ working schedules and even provided translators to increase the workshops’ accessibility. After several meetings, Liou was not surprised that the most pressing concern of Chinatown residents was affordable housing. ACDC created a report on the findings from these meetings and presented them to the City of Boston, leading the charge for affordable housing development at Parcel 12. This past December, the city approved a bid by the ACDC, real estate developers Millennium Partners and Corcoran Jennison, and Tufts Medical and Tufts University’s equal-part joint venture Tufts Shared Services to build affordable housing units at the site. In addition to its proposed 45 low-income rental units and about 126 lower to middle-income condos, the development includes a community space that could hold a branch for the Boston Public Library, 140 units for the DoubleTree Hotel owned by Corcoran Jennison next door, and 264 Tufts Medical Center parking units. 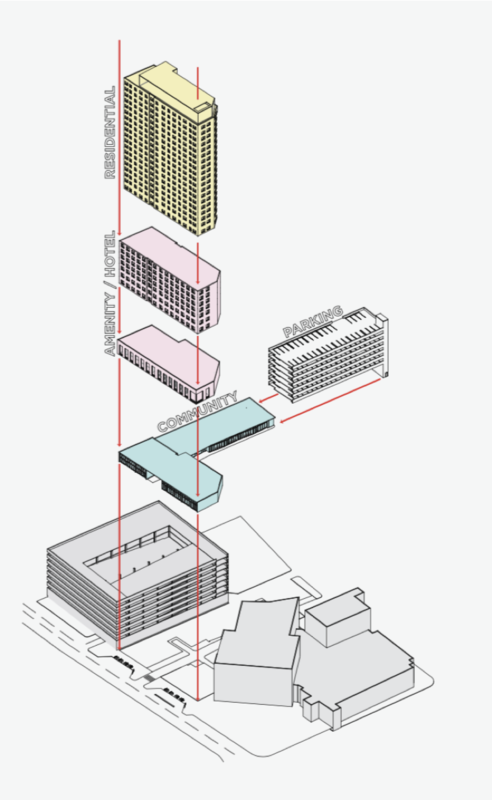 The development on Parcel 12, as depicted in the approved proposal. Liou noted the importance of Parcel 12 development considering the increasing scarcity of available publicly-owned land in Chinatown. The Parcel 12 development will be a more efficient and economical way to provide a large amount of affordable units than going through private owners, like the many who own row house properties. Liou remembered one row house that the ACDC once looked at on Tyler Street: “It was horrible inside,” Liou said. “It was a gut-job of asbestos, lead, code violations, you name it. Everything.” Liou estimated that buying and renovating the row house property would have taken a costly $600,000 per unit investment. “That’s the hard reality we’re fighting against,” she said. Despite the difficulties private ownership has made for the fight for low-income housing, Liou noted that many medical institutions have recently recognized the important connection between housing and health—electing to invest in the former. In the Boston area and around the country, hospitals have far exceeded Tufts in putting real community benefits directly into housing. 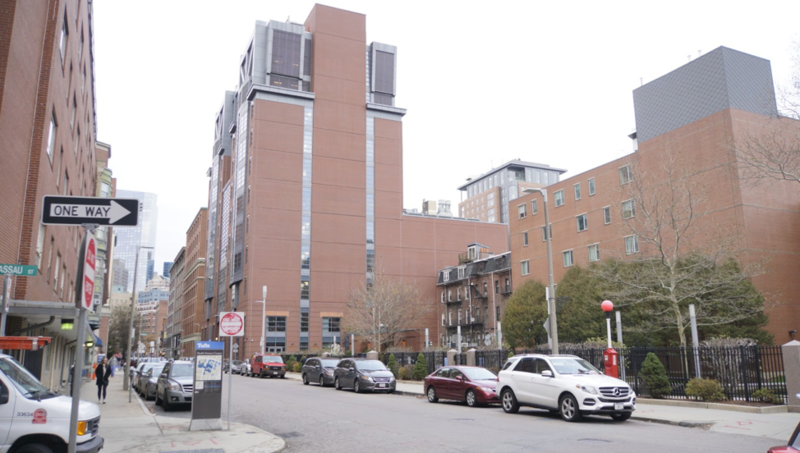 For example, in 2017, Boston Medical Center announced it would invest $6.5 million over five years into community organizations that directly fight homelessness and displacement in the vulnerable communities the hospital serves. 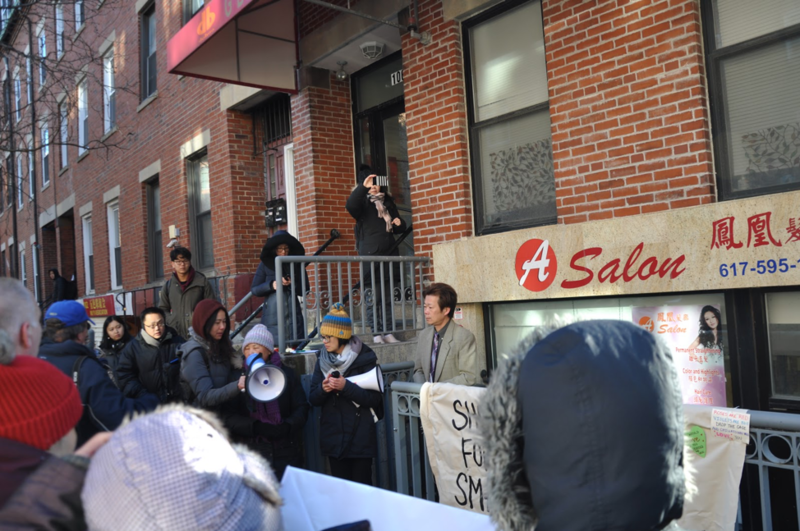 Although Tufts, which owns more than a third of Chinatown’s land, has invested in various Chinatown community partnerships, no such plans to invest directly in low-income housing have ever been announced. 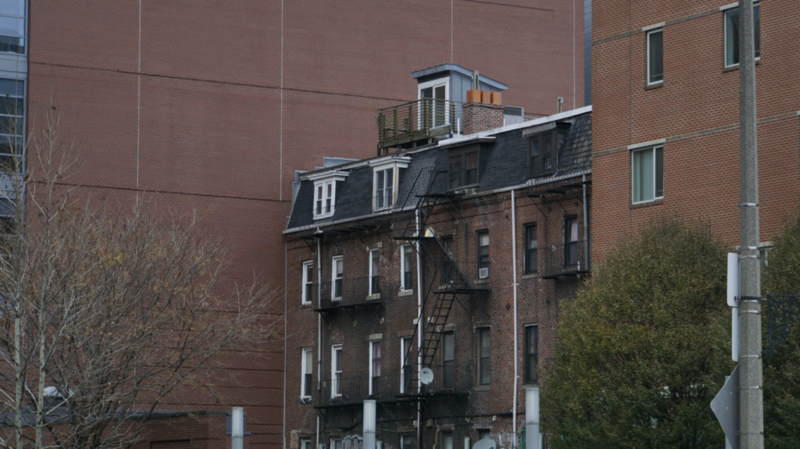 A row house on Harrison Avenue surrounded by Tufts Medical buildings. Image courtesy of Ethan Lam, Class of 2022. When asked to comment on the role that Tufts Shared Services would play in the future of the low-income Asian immigrant community in Chinatown, Director of Real Estate Robert Chihade did not respond. After YenChi Chen addressed his supporters, Pei Ying Yu took the megaphone. Yu was Chen’s neighbor on Hudson Street before a new owner bought the building and evicted her. Pei Ying Yu speaks at a press conference organized by Chinese Progressive Alliance an hour before YenChi Chen’s second court appearance. Chen stands to the right. Image by Issay Matsumoto. The crowds huddled in their jackets, listening to Yu’s charge. Boston City Councilor Ed Flynn, who helped push AirBnB ordinances in the city, expressed his support. The crowd dispersed as Chen was escorted by CPA organizers to the Edward Brooke Courthouse for his 9AM appearance. Chen sat in the front row of Courtroom C, surrounded by his legal team and CPA organizers. Asian American professionals, community members, and college students sat on Chen’s side of the courtroom—among them were seven current Tufts students and two alumni. Chen and his supporters waited for two hours in the courtroom only to be informed that the court-vetted Toishanese interpreter was unavailable. Chen would have to close his shop again the next Wednesday for a third court appearance. Small businesses like Chen’s serve an important role in providing affordable and linguistically-accessible services for Boston’s working-class Chinese immigrant community. But Chinatown is not only a business district—it is also a home and a community. The institutional forces shutting down small businesses like Chen’s and pricing out working-class immigrant residents constitute nothing less than the latest Chinese Exclusion; and they are linked to the struggles of communities of color across the country. To do our part in keeping this community together, students can share resources on Chinatown and Asian American histories. They can work on the volunteer committee, which has monthly Thursday night meetings, to produce educational materials on the row houses. Student groups like Tufts Asian Student Coalition fund transit fare to actions. Both can be contacted easily online. As Asian American Tufts students, we recognize our stake in Chinatown’s survival as a community for working-class immigrants. We reiterate the timeless charge of students and community members: Tufts Medical must invest in low-income housing for the community that supports it. We call on students to show up at critical moments for Chinatown residents, like the Asian American communities who came to support YenChi Chen in Courtroom C. Through this support, we bear witness to the cruelty of institutions perpetuating racist histories that date back to the 1800s. We tell them: our community is watching.